Player-coach Fabulous Flournoy - awarded an MBE in the New Year Honours - helped his side emerge 91-83 victors. Newcastle Eagles look to make history as they play Glasgow Rocks in search of their third consecutive cup final win. Newcastle Eagles sealed their place in the BBL cup final after their semi final win against London Lions. It's been a low-key Thanksgiving for Newcastle Eagles. While Americans across the world are tucking into their turkey dinner, the Eagles have been training hard ahead of their British Basketball League match against Manchester Giants on Friday night. We spoke to Drew Lasker, from Texas, who is one of six Americans on the Eagles' roster. Newcastle Eagles made it 10 straight victories in the BBL Championship after a convincing 119-81 win away at Manchester Giants. 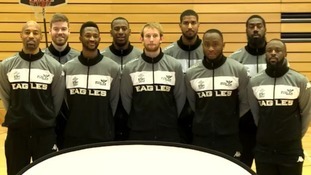 Newcastle Eagles forward Charles Smith says it's 'an honour' to be named British Basketball League Player of the Year. The 39-year-old veteran scooped the top individual player prize at this week's British Basketball Journalists' Association annual awards, fending off competition from Demond Watt of Cheshire Phoenix and his Eagles team-mate Rahmon Fletcher. The Eagles won this year's BBL Championship, BBL Cup and BBL Trophy, and could clinch a domestic 'clean sweep' in Sunday's BBL Play-off Final against London Lions at the O2 Arena. 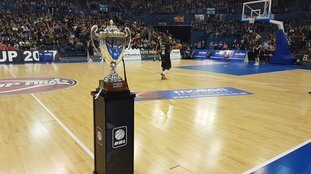 Newcastle Eagles have claimed their seventh British Basketball League title in 10 years with a 107-97 victory over the Manchester Giants. The title is their third piece of silverware this season after winning the BBL Cup and BBL Trophy. The chance of another grand slam of all four trophies is still on the cards. Newcastle Eagles will be without their player-coach Fabulous Flournoy for the rest of the season. He tore his Achilles tendon during the BBL Trophy Final on Sunday, which they won over Leicester. Her will have an operation on Thursday and then will be restricted to coaching as the Eagles try for a clean sweep of all four domestic basketball trophies.